​The Macaw Project - Biologists, Ecotourists and Local Communities for the Amazonian Rainforest, is a 26-minute documentary of macaw conservation research filmed in the Peruvian tropical rainforest. The documentary was made with the aim to direct public attention towards the problems that macaws and other creatures face in their natural habitat and the importance of scientific conservation research in this region. This film differs from previous nature documentaries because it is filmed mainly by the researchers themselves; something that is rarely seen on the screen. We explain the newest methods of conservation biology and present up-to-date findings in a comprehensible way in this spectacular movie. 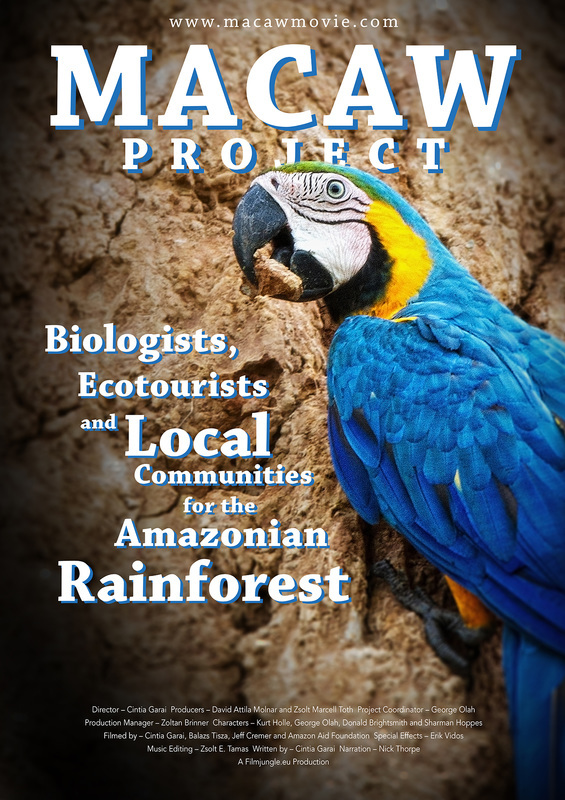 The Macaw Project also seeks to provide an alternative solution for biodiversity conservation: an internationally applicable model that can help to protect highly biodiverse places in many different regions of the Earth. Our model incorporates scientific research, eco-tourism, and the collaboration of local communities to live in their ecosystem in a sustainable way. We would like to express our deepest gratitude for the kindness of our many supporters that made this film a reality via a crowdfunding campaign: http://igg.me/at/macawmovie.